Visit Harvey Newton's web site www.Newton-Sports.com. Harvey S. Newton is a leading figure in the world of weightlifting. Not only is he a former U.S. Olympic team weightlifting coach and former executive director of the National Strength and Conditioning Association (NSCA), but he was also the first U.S. national coach and the first U.S. member of the International Weightlifting Federation’s Scientific and Research Committee. 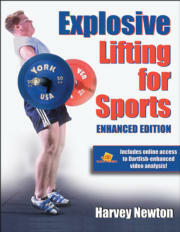 He is the former editor in chief of NSCA’s Strength and Conditioning. Newton holds an MA in sociology from the University of Colorado. A member of the USA Weightlifting Hall of Fame, he continues to lecture nationally and internationally on strength training and weightlifting. He also serves as strength and power consultant to many sport organizations through his business, Newton Sports. Newton resides in Maui, Hawaii. He spends his free time lifting weights, cycling, and reading.